FAIRFIELD, CT – WSHU Public Radio will host the latest in a series of live classical music performances entitled “Mozart: Hidden in Plain Sight” on Sunday, April 14, at 4 p.m. 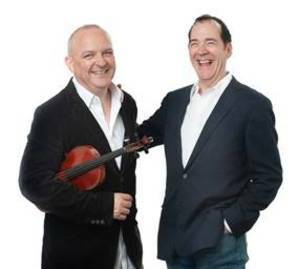 The concerts, which feature Grammy-nominated pianist Joshua Pierce and award-winning violinist Andrew Smith, present the entire series of Mozart’s violin sonatas – some of which are fragments discovered in Mozart’s journals, or pieces that are rarely performed live. Together, they reveal a uniquely personal perspective of Mozart’s journey from wunderkind to icon. Tickets are $20 for each concert. All concerts take place at the WSHU Broadcast Center on the campus of Sacred Heart University in Fairfield, CT. Tickets and a complete schedule are available at wshu.org. The series is generously sponsored by the family of Anita McPherson. Andrew Smith's multi-faceted career combines performance, composition and artistic leadership. As an award-winning violinist and champion of contemporary music, Andrew has performed with Sir Peter Maxwell Davis, John Corigliano, David McBride, James Sellars, Peter Seabourne, Jacob TV, Kenji Bunch, David Shol, Paul Brust, Robert Carl, George Benjamin, Hans Werner Henze and Bruce Mahin and others. As one of the most prolific session musicians of his generation, he can be heard on soundtracks for TV and Film, for Pop, Rock and Jazz and even on leading Gaming platforms such as Xbox, producing albums in multiple genres from classical to rock, pop and film. WSHU Public Radio is a group of not-for-profit, member-supported stations that bring the best in public broadcasting to 268,000* listeners in Connecticut and Long Island. An NPR member since 1984, the station airs highly regarded national programs such as Morning Edition, All Things Considered, Wait Wait…Don’t Tell Me!, and Marketplace; locally-produced classical music; and its own regional news coverage for which it has won five national Edward R. Murrow Awards and scores of other prizes. Its classical music program Sunday Baroque is syndicated and heard on over 100 stations nationwide. In addition to broadcasting on 12 traditional radio frequencies, it streams all of its programs atwww.wshu.org. A series of live concerts presenting the complete Mozart violin sonatas. Featuring pianist Joshua Pierce and violinist Andrew Smith.